The use of laser in oral and maxillofacial surgery has been widespread over the last decades with favorable experiences, and most of the oral soft-tissue surgical procedures are done using lasers. Among the commonly available lasers today, the diode laser is frequently used in dentistry. Bleeding control, visibility, and better tissue manipulation are some of the advantages of it. 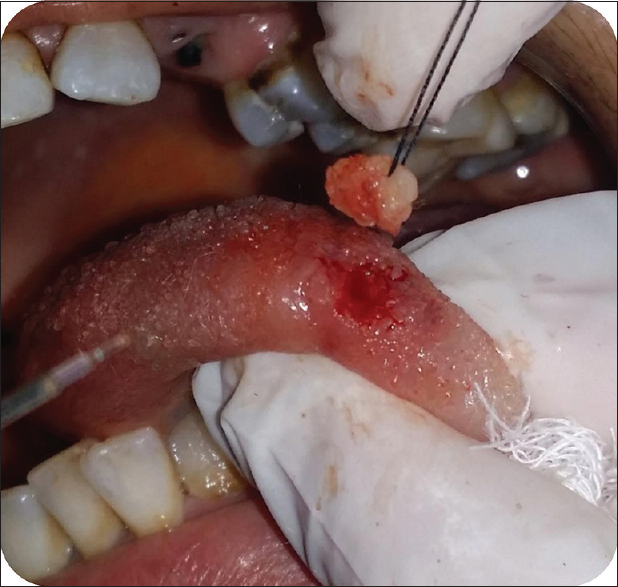 We aim to present a case of oral papilloma located on the lingual mucosa treated with diode laser and the successful postoperational follow-up with no sign of recurrence. A 40-year-old female patient was referred with a complaint of soft-tissue mass in her dorsal side of the tongue. According to the history, this lesion occurred 2 months ago; however, she neglected it until the patient recognized the expansion of the lesion size. Clinical examination showed that there was a pink-colored lesion located on the dorsal side of the tongue and was approximately 0.5 cm in length [Figure 1]. There was nothing abnormal in her systemic review. The lesion was completely excised, from its connection to the tongue under local anesthesia [Figure 2], [Figure 3], [Figure 4], [Figure 5], with diode laser. Immediately after laser therapy, the patient described a remarkable pain comfort [Figure 6]. One week later, the patient had no more pain, early healing, and reduction in the lesion size [Figure 7]. Two weeks later, the lesion was approximatively healed with no pain or discomfort [Figure 8]. One month later, we noted a complete tissue healing with no sign of recurrence [Figure 9]. In the oral cavity, papillomas most commonly occur on the palate (34%) [Figure 1] and jugal mucosa but may also affect the uvula, tongue, lips, and gingiva., These tumors are characterized by an exophytic, painless, and well-delimited growths, and the numerous small digitiform projections on their surface give them a clinical “cauliflower-like” appearance. Papillomas usually manifest as single, whitish lesions but may have the color of the surrounding mucosa. Although papillomas are typically small, generally measuring only few millimeters in diameter, there are reports of lesions measuring several centimeters., In general, the clinical appearance of oral papillomas is hardly distinguishable from that of common warts (verrucae vulgaris). For accurate differential diagnosis, it is necessary that any HPV that is normally found in skin lesions also be identified in the intraoral lesion. The papillomaviruses present in skin lesions that have been associated to intraoral common warts are HPV-2 and -575. A logical association for clinical diagnosis would be to establish a connection between the presence of common warts in the child's hands and fingers, habits such as thumb or finger-sucking and onychophagia, and the oral papilloma lesion., The histological examination of these lesions reveals the proliferation of the spinous layer cells, following a digitiform pattern with a delicate core of fibrous connective tissue constituting the supporting stroma., Variable degrees of inflammatory reaction can be observed in this stroma, depending on the existence of epithelial ulcerations. The treatment consists of complete excision of the base of the lesion and a small area of surrounding normal tissue using a number 15 stainless steel scalpel blade12. 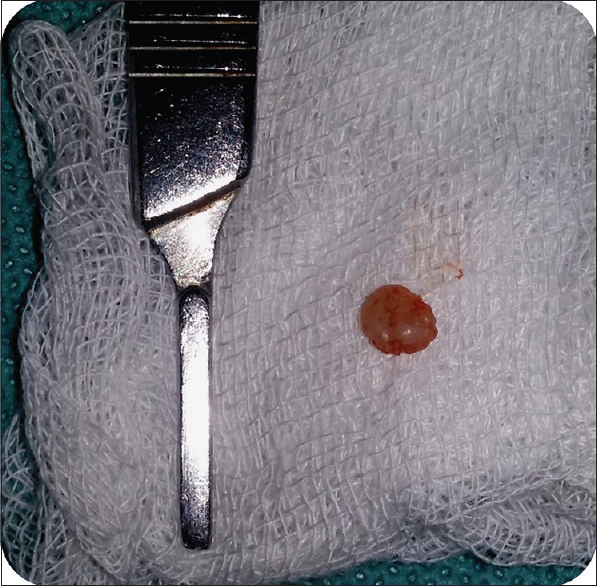 The specimen should be sent for histopathologic examination to confirm the clinical diagnosis of papilloma and to assure that the surgical intervention and treatment management of the pathology were adequately performed. Oral papillomas can be found in patients' oral cavity, and the clinical diagnosis of these lesions is important. Low-level laser therapy can be used by dental clinicians to treat these kinds of oral lesions and should be considered as an effective alternative to conventional surgery. Kerr AR, Phelan JA. Benign Lesions of the Oral Cavity. In: Greenberg MS, Glick, Ship, editors. Burket's Oral Medicine. Ontario, Canada: BC. Decker Inc.; 2007. p. 132-7. Jaju PP, Suvarna PV, Desai RS. Oral papilloma: Case report and review of literature. Int J Oral Sci 2017;2:222-5. Babaji P, Singh V, Chaurasia V, Masamatti V, Manmohan A. Oral papilloma of the hard palate. Indian J Dent 2014;5:211-3. Devi RS, Rajsekhar B, Srinivas GV, Moon NJ. Unusual length of pedicle: Pedunculated oral papilloma of uvula causing unusual dysphagia of long duration in a child of 10 years. Case Rep Dent 2014. [Epub ahead of print]. Harries ML, Juman S, Bailey CM. Recurrent respiratory papillomatosis in the larynx: Re-emergence of clinical disease following surgery. Int J Pediatr Otorhinolaryngol 1995;31:259-62. Carneiro TE, Marinho SA, Verli FD, Mesquita AT, Lima NL, Miranda JL, et al. Oral squamous papilloma: Clinical, histologic and immunohistochemical analyses. J Oral Sci 2009;51:367-72. Anselmi AL, Premoli de Percoco G. Epidemiologic study of 147 cases of oral papilloma (Venezuela). 1. Acta Odontol Venez 1989;27:27-32. Abbey LM, Page DG, Sawyer DR. The clinical and histopathologic features of a series of 464 oral squamous cell papillomas. Oral Surg Oral Med Oral Pathol 1980;49:419-28. Shimoda M, Kameyama K, Morinaga S, Tanaka Y, Hashiguchi K, Shimada M, et al. Malignant transformation of sialadenoma papilliferum of the palate: A case report. Virchows Arch 2004;445:641-6. MacDonald-Jankowski DS. A squamous cell papilloma as a cause of dysphagia and vomiting. Br Dent J 1990;168:480-1. Goodstein LA, Khan A, Pinczewski J, Young VN. Symptomatic squamous papilloma of the uvula: Report of a case and review of the literature. Case Rep Otolaryngol 2012;2012:1-2. Carneiro TE, Marinho SA, Verli FD, Mesquita AT, Lima NL, Miranda JL, et al. Oral squamous papilloma: Clinical, histologic and immunohistochemical analyses. J Oral Sci 2015;51:367-72. Khalighi HR, Hamian M, Abbas FM, Farhadi S. Simultaneous existence of giant cell fibroma and oral papilloma in the oral cavity. IJMS 2016;2:153-6. Jaju PP, Suvarna PV, Desai RS. Squamous papilloma: Case report and review of literature. Int J Oral Sci 2010;2:222-5. Monteiro LS, Mouzinho J, Azevedo A, Câmara MI, Martins MA, La Fuente JM, et al. Treatment of epulis fissuratum with carbon dioxide laser in a patient with antithrombotic medication. Braz Dent J 2012;23:77-81. Elanchezhiyan S, Renukadevi R, Vennila K. Comparison of diode laser-assisted surgery and conventional surgery in the management of hereditary ankyloglossia in siblings: A case report with scientific review. Lasers Med Sci 2013;28:7-12. Goodstein LA, Khan A, Pinczewski J, Young VN. Symptomatic squamous papilloma of the uvula: Report of a case and review of the literature. Case Rep Otolaryngol 2012;2012:329289.